Thursday, June 4, 2009 at 1:23 p.m. It seems our governor has a personal story and he finally wants to tell it. He grew up working on a farm and spent time in the Marines. Also, thoughts of his children and grandchildren and the love of a good woman pulled him though a near-fatal car accident. And importantly, he was fired up on Tuesday – like he really wants to win another term. Who cares if Corzine grew up on a farm in Illinois. The GOP’s got a guy who grew up on the hardscrabble streets of Livingston. And has a bigger Springsteen CD collection (which he’ll be playing at every campaign stop between now and November 3). We learned from a Star-Ledger report that Corzine’s big event with Vice President Joe Biden was almost derailed by the threat of a picket line by the state workers union. Is the CWA in danger of overplaying its hand? Probably not. We released a poll last month that showed most New Jersey voters side with them on furloughs and, more importantly, they were not aware of the tactics being used by the CWA to avoid concessions. No one expects him to win, but he’s a straight-shooter. Based on his interview with NJN Tuesday night, he could make the debates uncomfortable for both Corzine and Christie. His gracious concession speech and bearing throughout the campaign indicates that he enjoyed being taken seriously by both the media and members of his own party. Lonegan’s “line in the sand” comment (i.e. he will work to make sure Christie sticks to “Republican principles”) could be something that hard-core conservatives use to lobby on the Lieutenant Governor slot. Does Christie select a pick to help him (or more accurately, not hurt him) get the 200,000 or so undecided independent voters he needs to win this race? Or does he appease the 30,000-40,000 conservative voters who might sit this race out if he doesn’t choose a true believer as number two? You do the math. No, that’s not coming from the Christie camp. It’s the message of Corzine supporters (it’s clearly on their Talking Points memo). Specifically, they claim that Jon Corzine’s poor approval ratings are simply a byproduct of the tough choices he’s had to make during this economic downturn. And given voters’ short memories, that just might work. 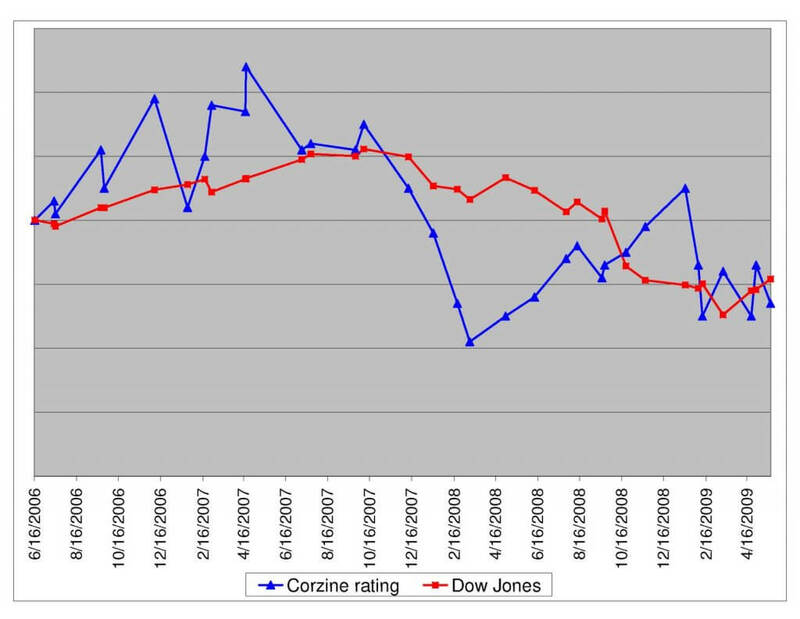 However, as the chart below illustrates, Corzine’s job approval dropped well before the Dow Jones did. [“Pay no attention to that toll hike plan behind the curtain.”] Perhaps Corzine’s job approval rating is a leading indicator for the economy? 8. Yes, we can … bring up Obama as much as possible! Pop quiz: Who is the only political figure of either party, state or national, who holds a 60% approval rating among New Jersey’s independent voters? Look at the chart above again. See that spike in Corzine’s rating that occurs between November 2008 and the presidential inauguration in January? It’s not a coincidence. “Bushwacked!” That’s what Governor Corzine said would happen to the state if the Republicans were in power here like they were in DC for much of the past decade. Yeah, I know Bush is out of office, but he’s an effective avatar to hang around Christie’s neck (How’s that for a mixed metaphor?). The Bush presidency still resonates with voters as emblematic of “failure” and “partisanship.” And, unlike Christie’s attempt to tie Corzine to McGreevey, there are tangible connections between the GOP nominee and the former president. We’ll be hearing more (and more and more) about this. “Change!” According to the GOP standard bearer, the 2009 gubernatorial election in New Jersey is all about change – just like the 2008 presidential contest. Wrong! American voters tired of the Republican regime in DC because they saw the national party as partisan ideologues who were not looking out for the nation’s best interest. So it was worth giving Democrats a shot. Here in New Jersey? The voters see it more as a choice between Republocrat or Demican – both parties are equally to blame for the mess in Trenton, so what’s the point of choosing between the two. Significantly, of the 80 Assembly seats up for grabs in November, it looks like only 2 (!!!!) have any shot of switching parties. So change for change’s sake is not a message that will resonate in New Jersey. On Monday, I posted that the cumulative vote total in just five counties – Bergen, Morris, Burlington, Monmouth, and Ocean – has been an uncanny predictor of the statewide vote. The same was true this year – Christie beat Lonegan by 56% to 41% in these five counties, nearly identical to his 55% to 42% margin statewide. Only one incumbent got knocked off in the Legislative primaries on Tuesday. And I called it!